Chris was a passenger in a float plane accident on Tyaughton Lake, BC when he lost his life. He was born in Calgary, AB and grew up in Maple Creek, SK from age 2. Chris played many sports – hockey, baseball, track and distance running. He loved the outdoors and had an adventurous spirit for biking, hiking, skiing, motor biking and hunting. He always had his backpack with him and was prepared for any emergency. He loved to fix and build things. Chris always had his faithful dog Casper by his side. Following high school, he attended university, worked at Kal Tire and was on the volunteer fire department for 3 years. He also took up scuba diving and climbing. Corporal Chris Holmes served in the Canadian Military Reserves for 10 years at South Alberta Light Horse regiment in Medicine Hat and King’s Own Regiment in Calgary. Chris persisted with his passion of flying. He received his private pilot’s license in 2009, his commercial rating in 2014, and his bush pilot rating in April of 2017. He was immediately hired by Fort Langley Air in BC and knew he had found his dream job. He would fly people on tours to beautiful lakes and took some amazing photos. He also instructed float plane lessons to other pilots always taking time to finish small details. He quickly became well respected and sought after in the aviation community. Chris will be sadly missed by his parents Blair and Peggi Holmes, sister Megan and husband Aaron Kozak and sister Jaclyn. Grandparents Alf and Evelyn Stork and Gordon and Ramona Holmes. Also, by his numerous aunts, uncles, cousins and friends. Friends and family describe Chris as brave, adventurous and caring. 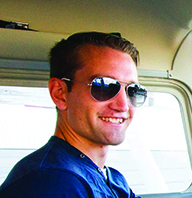 In memory of Chris his family has created a Chris Holmes Flight Scholarship to help pilots from Maple Creek and Southwestern Saskatchewan follow in Chris’ footsteps and realize their own dreams of flying. Donations may be made at https://www.gofundme.com/chrisholmes <https://www.gofundme.com/chrisholmes> or directly to his family or to a charity of your choice. A funeral service was held on Monday, August 13, 2018 at the Maple Creek Armoury with Reverend Michele Rowe and Archdeacon Peter Boote officiating. Binkley’s Funeral Service, Maple Creek & Leader entrusted with arrangements. Condolences may be offered to the family at binkleysfuneralservice.com.